About The Courtyard Dairy. History and Philosophy. The Courtyard Dairy is a unique, specialist cheese-shop and cheese-maturer, owned and operated by Andy and Kathy Swinscoe. In 2017 the shop expanded into new premises and at the same time a museum telling the history and story of farmhouse cheese, a café serving cheese-based dishes (and, of course, coffee! ), and a cheese production room were added, alongside plenty of free on-site parking. The shop itself has become a renowned destination shop, where regulars and visitors alike enjoy the opportunity to sample and purchase some of the finest cheese to be found in Europe, whilst benefiting from Andy and Kathy’s comprehensive and entertaining cheese knowledge. Get directions to the shop, cafe and museum here. Andy Swinscoe originates from Cumbria, and at an early age embarked on a quest to find the finest cheeses available. Whilst working in restaurants in England and France, and in particular the Edinburgh Balmoral Hotel’s Michelin-starred restaurant, he further developed his passion for cheese. After earning a first-class honours degree from Sheffield Hallam University in ‘Culinary Arts and Hospitality’, he worked briefly for Paxton and Whitfield – Britain’s oldest cheesemonger – hand-delivering cheese, even to Buckingham Palace itself. There followed an award in ‘Cheese Maturing’ from the Queen Elizabeth Scholarship Trust, which enabled Andy to indulge his passion for cheese and complete an apprenticeship in the intricate art of affinage (ageing cheese) in France with Hervé Mons (widely regarded as the best affineur in the world). It is here Andy refined his expertise, learnt how to age cheese and spent much time visiting and making cheese, from Salers du Tradition, to Comté and Ste Maure. Returning to England to work for Bath’s Fine Cheese Company, he took up responsibility for cheese quality and selecting cheese direct from farms, a job he found exciting: “One moment I was off selecting Gruyère in Switzerland, the next I was helping to open a cheese shop in Qatar!” Kathy Swinscoe is equally passionate about fine food, having worked for many years in fine dining in Edinburgh, coupled with regular visits to cheese makers with Andy. Later, she moved to Bath to work for wine importer William Baber. Throughout their careers Andy and Kathy have continued to visit and meet with many of the finest cheese-makers, helping to make cheeses such as the buttery and lactic Kirkham’s Lancashire and the creamy Vacherin Mont d’Or. Some of their stories and tales can be found here. Andy and Kathy decided in 2012 to open their own specialist cheese shop and refiner: The Courtyard Dairy. Read the progress of how the shop was set-up here. The Courtyard Dairy was created with the ethos to sell only the best cheese available from the British Isles and the Continent of Europe; and by doing so, to champion and support the few remaining independent farmhouse cheese-makers: real great farmhouse British cheese. These small individual farmers still make the cheese by hand with unpasteurised milk from their own herds, in order to get the best depth of flavour. Each cheese is then aged to perfection in The Courtyard Dairy’s maturing cheese room near Settle. Soon after opening, The Courtyard Dairy won The Best New Cheese Retailer at the 2013 British Cheese Awards, and was a runner-up for Yorkshire Food Destination of the Year 2013. 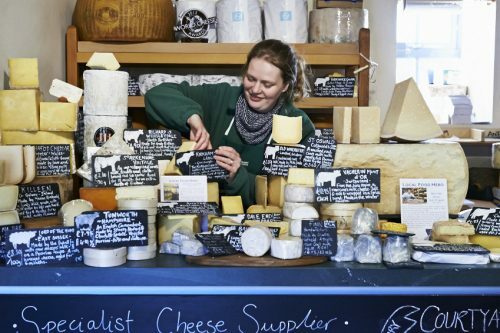 Following these accolades The Courtyard Dairy also won ‘Best Cheese Counter’ and ‘Cheesemonger of The Year’ at The World Cheese Awards 2013; and then was a runner-up in BBC Radio 4 Food and Farming Awards 2014 ‘Best Food Retailer’ and Observer Food Monthly Awards 2015. In 2016, and again in 2018, it went on to win ‘Cheesemonger of The Year’ at the Farm Shop and Deli Awards. 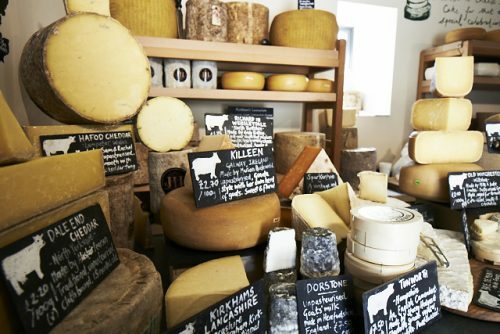 The shop continues to receive awards and high accolades [click here for details]; and has also been named one of the top 15 cheese shops in the UK by both The Daily Telegraph (2016) and The Times (2017). Be sure to come and experience for yourself this proper cheesemongers or order some of their amazing cheeses online. The Courtyard Dairy’s Cheese Experience was funded by grant support from European Agricultural Fund for Rural Development. This funding allowed The Courtyard Dairy to create it’s new visitor centre/museum area, cafe and cheese-make room in 2017, by grant funding for building works, new equipment and marketing material.